I first created this bag as the wrap for a gift that was being given to a friend. This friend had long been in search for a special tarot deck. After – what seemed like – an exhaustive search, we found the elusive deck. This lovely deck needed a special way to present it as a gift. So this bag was birthed. While the initial intent of this bag was for a tarot deck; the approximately 5 by 7 inch bag is so perfect for so many gift giving ideas. How perfect would this be for secret Santa’s, gifts for those who add so much to our lives (neighbors, friends, mail carriers, hair stylists, etc)? Its like giving 2 gifts in 1! One button of approximately 7/8 to 1 inch in diameter. With Cuff Color Chain 22. Rw 9 – Sc dec, Sc in next 4 sc, Ch 3, Skip 3 stitches, Sc next 4 sc, Sc dec.
Sc, Sc dec. Cut and secure yarn. Align cuff top to top of one stocking side. 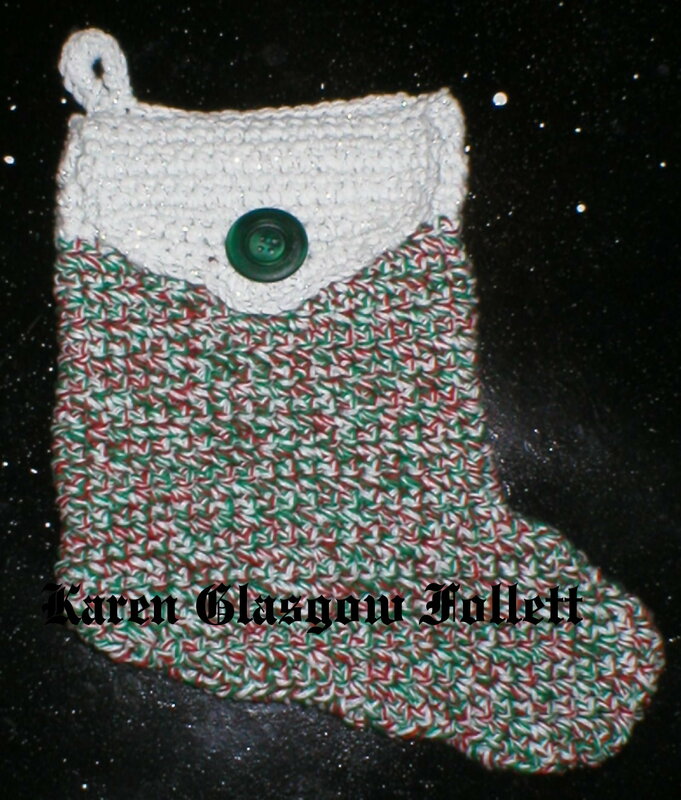 There will be one unworked stitch on either side of the stocking top. Careful not to twist the chain, join back to cuff / stocking top in sc 19 with a slip stitch. Slip stitch in sc 18 of cuff stocking, turn. Sc in each chain of strap, slip stitch back into sc 19. Cut and secure yarn. Align edges. Sew edges together with whip stitching or with single crochet. Cut and secure yarn, weave in all ends. Center front flap over stocking front. Place button under the button hole of the front flap. Sew in place.